Mindfulness is known as the ability to pull your attention into the present moment, increasing your awareness of the thoughts that are happening as they happen. When you pause to let go and really just allow yourself to be in the present moment, relaxation, naturally, just happens! As you think about trying to explain meditation or mindfulness practice to your child, you might wonder where to begin. It all starts with the ability to be still, to pay attention to the present moment, and to begin increasing awareness about the thoughts you are having. 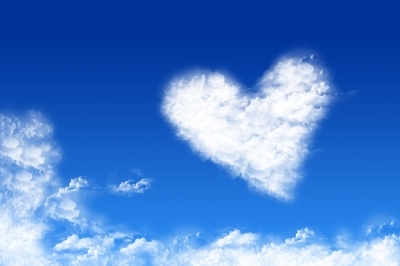 Try this Cloud Thoughts activity with your child as a perfect starting place. (Materials: A fluffy cloud day, a spot of lush green grass, a blanket and some sunglasses) Invite your child to go with you outside, to lie down in the grass, and to watch the clouds in the sky. Tell her that you are going to take a cloud journey, simply paying attention to the clouds as they float across the sky. Share with her that you are going to do it in silence and that there will be time to share your experiences with each other later. Spend a few moments just relaxing on the blanket and watching the clouds as float past. Watch as they dance, float, morph and transform on their journey across the sky. See what kind of animals or shapes they make. You can share your experiences with each other later while you are doing step two. (Materials: timer, crayons, pencils and paper) Go back inside and get some drawing materials. Draw a picture of clouds with your child. Place it in front of you and set a timer for 3 minutes. Tell your child that you are going to simply watch the picture, just like you did outside, and pay attention to the thoughts that drift into and out of your mind like clouds. No need to try to stop or change the thoughts, just watch them with interest. If you like, you can pretend you are a thought scientist and you have been given the task to simply notice and pay attention to the thoughts in your head to see what they have to say. You might be surprised at the thoughts, what they contain and what they want to do. You might notice having more or less thoughts. Just watch with interest for three minutes. Step Three: When three minutes are up, tell your child that you are going to take the picture you have drawn and write in the clouds some of the thoughts you noticed. Make this a daily practice. Practice for three minutes each day and notice how it gets easier to watch your thoughts drifting in and out and around in your head like clouds in the sky. Skip step one and complete steps two and three before bed each night. Start a Cloud Thoughts journal for paying attention to and collecting the thoughts in your head. Discuss any changes you notice as you experience the activity over time. Notice if the thoughts change, if the speed with which they float in and out changes, if the speed changes related to how you are feeling that day, if you feel more or less relaxed after the experience, etc. . .